The 6430B and 6440B Precision Component Analyzers provide thorough and accurate testing of any passive component to high resolution. In particular, for capacitor manufacturers, the instruments provide capabilities for both fast automatic production testing and complete design characterisation. Users include designers of passive components, manufacturing test, designing and testing materials as well as circuit designers who are evaluating component characteristics. The resonant frequency can be automatically calculated for any component together with its equivalent series or parallel circuit at that frequency. Both instruments are designed for high performance testing of components, with a basic accuracy of 0.02%, at a low price. 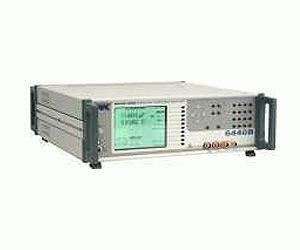 6430B is the entry level instrument covering to 500 kHz whilst the fully featured 6440B covers to 3 MHz. To evaluate a component performance at high speed over a specified range of frequencies, multi frequency mode is used. In this mode the operator decides which parameter is to be measured and at what frequencies. The 6430B and 6440B does the rest, creating an easy to read table on the large LCD display. Each test can have a simple Pass/Fail display.